For those looking to experience amazing landscapes, untouched and untamed nature and an insight which not many travelers achieve, Corroboree Billabong is a great place to visit. Located only 75 - 90 minutes away from Darwin, Wetland Cruises are conducting boat cruises along this pristine wetland area daily. Exploring these wetlands on our boat, travellers will see thousands of exotic birdlife which flourish and live in this area, as well as getting a close up look at saltwater crocodiles in their natural environment. Visitors can reach the cruise by driving themselves or be picked up from their Darwin accommodation. If your looking for things to do in Darwin, this is a great adventure which will leave you wide eyed and wanting more. Photographers are encouraged to join our tours. This pristine wetland is only 105km from Darwin, on your way to Kakadu or 165km from Jabiru on your way back to Darwin! You don’t need a 4 wheel drive to reach us. We have shuttle buses that can pick you up from the Arnhem Highway and/or from your accommodation. 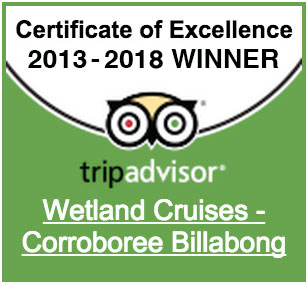 The idea of boat cruises on Corroboree Billabong is recent. This means this area is untouched and un-spoilt by tourism. And we wan’t to keep it that way. We are the original operator here and have been operating cruises since 2001. Over this time, the wildlife has become accustomed to our boat allowing us to get up close and personal for great photo opportunities. Corroboree Billabong is any amateur’s or professional photographers dream. Huge amounts of birds, crocodiles and other wildlife inhabit and flourish on this pristine wetland eco system. Check out our gallery. Wildlife - Corroboree Billabong is part of the Mary River Wetlands which boast the largest concentration of saltwater crocodiles in the world. Facilities – Our floating “passenger waiting area” at the cruise provides shaded seating with fans and Free Wifi. It is decorated with interpretive signage ,inspirational wildlife images an also has an upper observation deck. Location - Corroboree Billabong is only105km from Darwin, our 1 day tour offers the closest wetland experience to Darwin and is a 210km return trip compared to a 600km return trip to very similar wetland experiences in Kakadu. Products & Pricing - We offer a range of cruises that our competitors do not have available. Our cruises are around 25% cheaper than those on offer in Kakadu and our group sizes are much smaller with our boats carrying a maximum of 29 passengers compared to 60 passengers. Travellers looking for things to do in Darwin, it is highly recommended to visit Corroboree Billabong. Away from the crowds, we are one of the best kept secrets in the Northern Territory. If you are independent travellers with your own transport, you can join us for a magical wetland cruise on Corroboree Billabong with crocodiles, birds and wildlife in their natural environment.